I'm always a little suspicious of films with a religious message. One need only take a look at the mass of low quality films that are churned out aimed at the Christian market every year (ie Left Behind) to see that all too often the emphasis is on evangelistic propaganda rather than real quality artistry. So when I was perusing the press notes for Iranian filmmaker Majid Majidi's The Song of Sparrows, I became a little wary when I read that it extols Islamic virtues. The film even opens with the title card, "In the Name of God." For me, one of the cardinal sins of filmmaking is for a film to feel as if its preaching at me. If there is a lesson to be learned, it should speak for itself, not be rammed down the audience's throat. So I was pleasantly surprised that The Song of Sparrows totally avoids religious pontificating, and instead delivers a beautiful and charming morality tale whose virtues are unmistakably Muslim in character, but also completely universal. 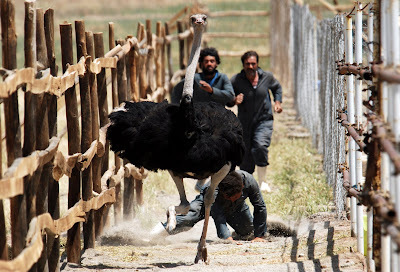 At the center of this little parable is Karim (Reza Naji), an unassuming ostrich farmer who lives out in the Iranian countryside with his family. But after an ostrich escapes the farm under his watch, Karim suddenly finds himself without a job, and his daughter in need of an expensive new hearing aid. So Karim hops on his motorbike and heads to Tehran, hoping to get the hearing aid repaired, but along the way he is mistaken for a cabbie, and discovers that driving clients around Tehran is more lucrative than farming ostriches. Traveling to Tehran becomes a regular occurrence for Karim, where he not only drives people around, but begins hording discarded items he finds on the side of the road. Soon, his family begins to notice changes in Karim. His generous and giving nature seems to be overtaken by increased desire for material possessions, and things he would have once gladly given away to neighbors in need, he is now holding for profit. As Karim begins to lose sight of what his most important, his son and a group of local children embark on a quest to raise money to buy fish for an old well they are repairing, and Karim's own greed begins to clash with the innocent dreams of his son. Majidi never turns the film into a sappy melodrama or a overwrought "message movie." He sets out to tell a simple morality tale that stands alone and speaks for itself. The fact that is infused with an Islamic sensibility is almost beside the point. The Song of Sparrows is about the corrupting dangers of materialism, but it is ultimately about family, spirituality, and love. The mountain of possessions that Karim amasses eventually overwhelm him, separating from his wife, his children, and from Allah. No matter what your faith (or lack thereof), the themes are universal. It is a lesson that transcends religion and extends into all cultures. The film is shot in a sparse style with a cast of mostly non-professional actors, which gives it at atmosphere of earthy realism. But there is a sense of magic at work here as well. Karim is a kind of window, an avatar if you will, for the audience to project themselves upon. Majidi is inviting us to examine our own lives, regardless of religious affiliations, and reflect on life's simple beauty. The Song of Sparrows is at once dryly funny and deeply moving; an affecting portrait of an Iranian family as they deal with the struggles of every day life. It is a warm hearted film of simple virtues and tender grace, a film defined by its humanity and adherence to tradition in the face of the growing onslaught of modernity. It asks the question, how can humans retain their goodness in an increasingly fast paced and self centered modern world? In Karim we find our answer, as delicate and beautiful as the song of a sparrow. 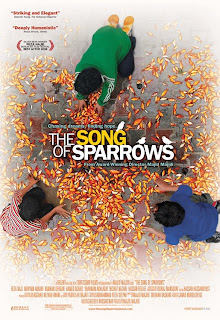 THE SONG OF SPARROWS; Directed by Majid Majidi; Stars Reza Naji, Maryam Akbari, Kamran Dehgan, Hamed Aghazi, Shabnam Akhlaghi, Neshat Nazari; Rated PG for brief mild language; In Farsi w/English subtitles. Opens Friday, April 3, in New York. I'm happy to hear it's not a religious propaganda piece and your explanation of the film's context makes it rather as must-see. Interesting that early in the year we have some compelling features from Islamic directors, even if Mr. Bahrani's film bleeds decisively into rural Americana. "So I was presently surprised when The Song of Sparrows totally avoids religious pontificating, and instead delivers a beautiful and charming morality tale whose virtues are unmistakably Muslim in character, but also completely universal." Sold. Exceedingly fine review here. Thanks Sam! This one will be in your neck of the woods on Friday. I look forward to hearing your thoughts.